December 5, 2013 - VIP Bing film Screening and Abstract Expressionist Dinner Fundraiser celebrating the life of Bernice Bing. 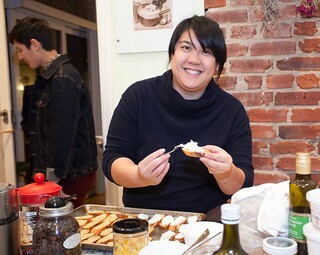 The meal was lovingly crafted by Melanie Elvena, Michelle Lee, Shari Arai DeBoer and Mido Lee. Exquisite food and a creative cocktail were enjoyed by all. Special thanks to our other expert volunteers, Michi, Edward and Diana, Dave and Doris for sharing their lovely home and wonderfully appointed kitchen.